There is nothing more soothing than the almost mesmerizing glow of light cast by a mica shade. From the feeling of coziness on a cold winter nite to the sense of relaxation following a hot exhaustive day, a mica lamp is an elegant statement. A product of the early 1900�s Arts & Crafts period, Mica lamps seem a natural element of bungalow furnishings period or contemporary. They can be a floor lamp next to the chair by the fireplace, a welcoming table lamp on the hall table, a relaxing lantern fixture in the upstairs hall, a little table lamp for the dresser in the boudoir, a nite lite in the nursery, or a beautiful glow above the dining room table. The foremost creator of mica lamps was Dirk van Erp of 1910 San Francisco. His hand crafted lamps, made entirely of copper with mica panel shades are some of today�s most prized antiques. Signed originals sell regularly at auction at prices in the high tens of thousands of dollars. 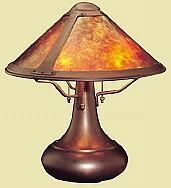 The Mica Lamp Company of California carries on the van Erp hand crafted tradition. Their lamps are completely handcrafted in the USA. All the parts are made of solid copper, are assembled with hand driven rivets and are finished with a rich brown natural patina. The shade panels are made of the same natural mica flakes bound with shellac to create the same variations of color patterns and tones as the antiques. There are reproductions and then there are reproductions. Don�t be disappointed and settle for less. The Mica Lamp Company Lamps are the real thing. When ordering, PLEASE SPECIFY (during checkout) your choice of mica color: Orange (the best for ambiance) or Almond (the best to read by). If no choice is specified, we will ship the color that is pictured. Mica Lamp Company lighting is SHIPPED FREE from its manufacturing plant in Pacoima, California USA! Most Mica Lamps are fabricated to order, so PLEASE ALLOW 6 WEEKS FOR DELIVERY . California Customers Please Note: The State of California now requires The Mica Lamp Company to charge and collect a Sales Tax on all purchases for SHIP TO addresses within California. Fair Oak Workshops must necessarily pass along the Mica Lamp tax charge to our California customers.